Before 2011, I’d maybe seen two Giant Swallowtails in Minneapolis…in 30 years! 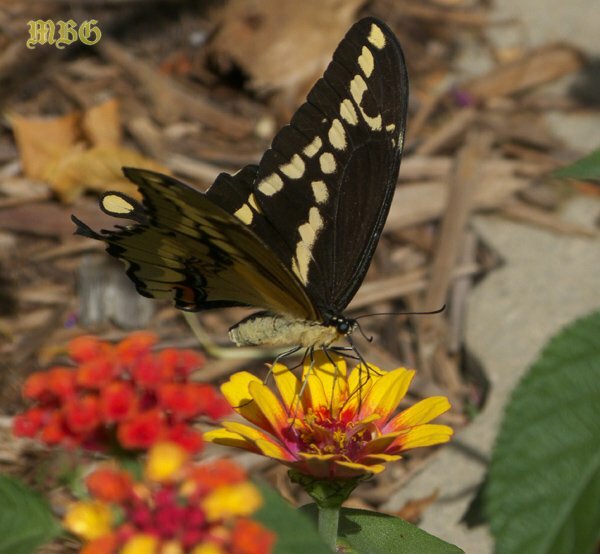 But, as temperatures trend tropical, those living in the northern US and Canada are reporting more sightings of the Giant Swallowtail Butterfly (Papilio cresphontes). This beautiful black and yellow butterfly is hard to miss with a wingspan of up to 7” across. In fact, this swallowtail species is the largest butterfly to flutter throughout the US and Canada. Since GST’s are most common in Central and South America, I wasn’t surprised to find they preferred our non-native zinnias and lantana here in Minnesota. 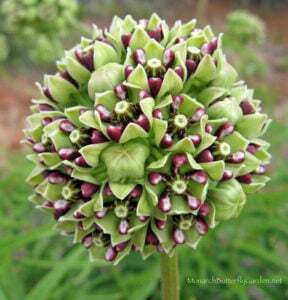 Giants also are frequent visitors to swamp milkweed and tropical milkweed flowers. Giant swallowtail caterpillars feed on a variety of trees within the citrus family (Rutaceae) including sweet orange, lime, and the hoptree. They are sometimes referred to as “orange dogs” and they hide amongst the foliage perfectly disguised…as bird poop! Some predators have figured out their “crappy camouflage,” but it’s likely allowed many to reach butterhood. Host plants are the cornerstone of any successful butterfly garden. This host plant directory makes it easy for you to find the plants you need to create a successful butterfly garden. Visit often for new host plant ideas. This small citrus plant fits perfectly in most butterfly gardens and tops out at just 3 feet high and wide. Black swallowtails will also use this as a host plant. This is the northern most member of the citrus family and is reported to be a favorite of northern venturing giants. It thrives in USDA hardiness zones 3-7 which means even Canadians have a shot at giant glory! In fact, this is the host plant we’ve used to Raise Giant Swallowtails in Minnesota. This smaller host tree is an excellent space-saving option. 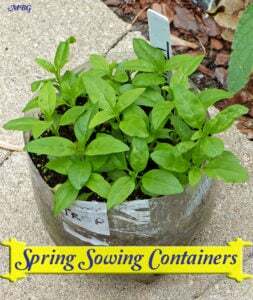 It tops out around 15 feet so it won’t take over your yard and it can even be potted. The butterflies have been reported to feed on nectar from azalea, goldenrod, lantana, swamp milkweed, and more. In our northern garden, they couldn’t get enough of the profusion zinnias last summer. I thought this was odd because I rarely see “big” butterflies on the smaller zinnia flowers. Tiger swallowtails were also frequent visitors. 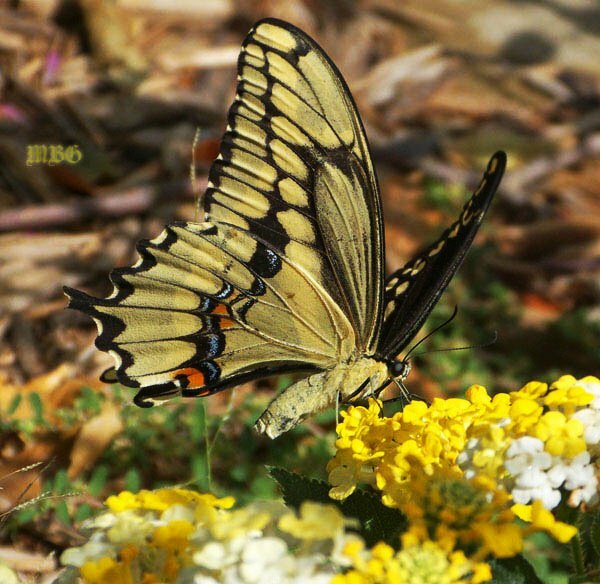 As the Giant Swallowtail butterfly continues to expand it’s territory north, more of you will have the opportunity to host them in your gardens. If you’d like to attract these giant black beauties to your yard this season, entice them with offerings from our butterfly plants page. I’ve been pleasantly surprised to find that GST’s have a nectar-tooth for many of the same garden flowers as monarch butterflies. Have you noticed this too? Please comment below about your experience with host plants and nectar plants that attract giant swallowtails and help a butterfly gardener out! How long do giant swallowtail butterflies live? I had one enclose today in West-Central Kansas. Do they migrate south? 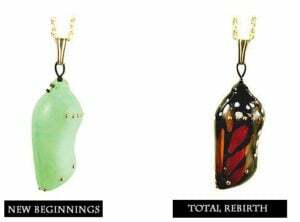 I have another in chrysalis and two that are still caterpillars. I was hoping they wouldn’t enclose this fall. Hi Patsy, this is often to find…I think you might have better luck if you do a google search in spring…I will update blog pages if I come across any reliable sources. First time ever in my Brooklyn Park, Mn garden, I spotted a Giant Swallowtail.It was the third and then the fourth week in August. 2017. I was so excited. I watch for butterflies daily, noting the favorite plants. The Mexican Sunflower is at the top of the list for all of them. Exciting news Marlene….our giant visitors really like lantana and the profusion zinnias. Northern prickly ash is their preferred host plant in our region. Enjoy! We’ve just moved from Northern Ontario (Sudbury area) to Oakville Ontario. I saw my first Black Swallowtail, AND my first Giant Swallowtail this summer! It’s SOO exciting to see different species. Do you have Luna Moths down here? Or Cecropia? We have them up North, although it’s a rare sighting. I have been quite successful attracting Black Swallowtails and Monarchs, and recently planted half a dozen spicebushes and pawpaw trees to hopefully attract egg laying spicebush swallowtails and zebras. I have a number of rue plants (northern Indiana), but have seen no Giant Swallowtails. 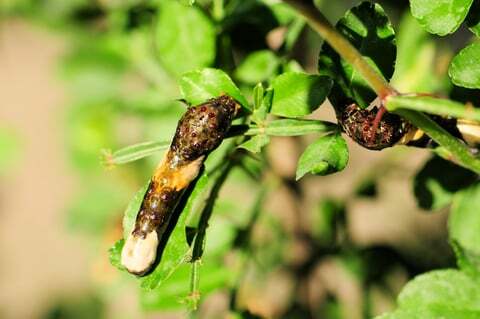 Do I stand a better chance with northern prickly ash or hop tree? If so, any idea where I would purchase either one? I have been unsuccessful in my online search. Thank you. no thorns on the hop tree (Ptlelea trifoliata). It grows pretty slowly, but ours was stunted from rabbit munching last winter. It’s protected now, so hoping for more progress this season. I live in Whittier, California and today I discovered a GST under a pile of lime branches I had trimmed the day before. Its wings were still wrinkled and I coaxed it onto a sturdy branch where the wings could fully expand. It was a beautiful experience and I have never seen one in my area. I identified it from a U.C. Irvine website photo. One comment on that site was that citrus trees were a plant they favor. I believe it since it must have been on my lime tree and I also have a lemon and two orange trees. Now that I know what to look for I will keep an eye out for more next season. I live in La Mirada and a GST hung around my yard for more than half an hour. I had no idea what kind of butterfly it was and I was surprised to find that they’re rare around here. I live in south-central Pennsylvania, and, even though I have never seen a GST, I found a single egg on my rue plant. Thinking it might be a black swallowtail on steroids, I raised it with other black swallowtail eggs. When the caterpillar kept outgrowing the others, it became obvious that I had a different species. Now that the caterpillar is starting to pupate, I am concerned that it is getting late in the season for it to eclose. I have read that the chrysalis can be placed in the refrigerator to ensure that the butterfly will not emerge until next spring. May I have your comments and suggestions as to what I should do. This will be my first viewing of a Giant Swallowtail, and I don’t want to do anything that will endanger its survival. Thank you. Hi Roberta, I put ours in a 3-season porch all winter and some people will put them in the garage. I have never used the refrigerator method so i would talk to someone else who has first hand experience…congrats and good luck! The reports of Giant Swallowtails in the north are intriguing! I don’t have fruit trees but do have one rue plant among my offerings. I live 42 km. North of North Bay, Ontario, Canada and saw a Giant Swallowtail for the very first time. It fed most of the afternoon on my Purple Cone flowers and red Bee Balm. I was able to get many photographs. What a nice surprise! Also want to add that this Giant Swallowtail had both its wings damaged and maybe as a result of severe weather in the southern region could this poor beauty gotten swept away and ended here in northern Ontario. Hi Julie…how exciting! Swallowtails wings get beat up pretty easily, by both weather and potential predators. I hope it hangs around your garden for a few days…enjoy! Today was my first ever sighting of a Giant Swallowtail! It flew away just after I took a picture of it on my butterfly bushes. 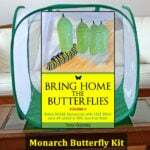 I’m well aware of the plight of Monarchs and am trying to aid their recovery. In the past four years, I’ve raised and released hundreds of Black Swallowtails (many from the egg), but this year I’m finding very few. I plant host plants in my garden tubs specifically for them. Today I have only two Black Swallowtails in the chrysalis stage and hope to have butterflies to release by August 14 and 17. Our loss of butterflies is very disturbing to me. I saw Giant Swallowtails the summers of 2013 and 2014 in Goodhue Cty. Minnesota. last summer 2015 after two years of below average winters- in 2015 I saw not a GST . 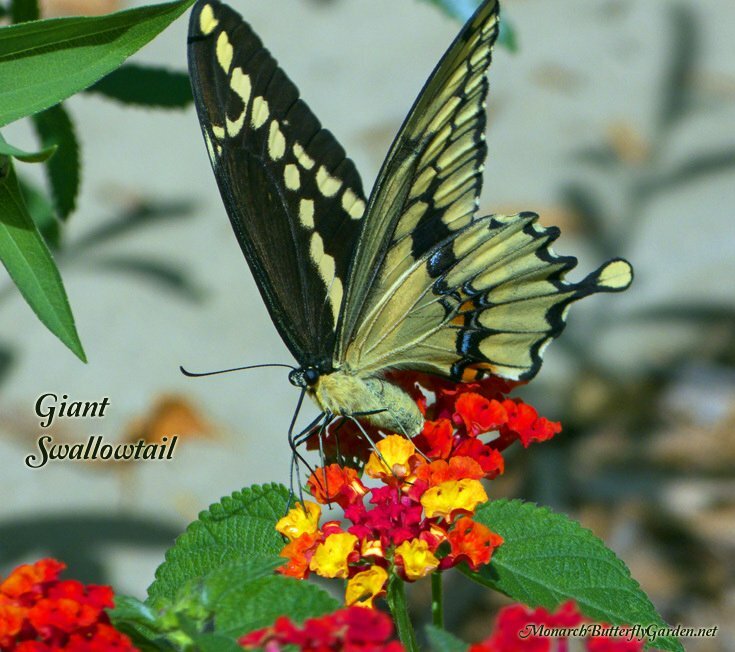 saw GiantSwallowtails in large #s. Do you anticipate this? I find them along waterways. Hi John, we had seen them for the last 5 seasons and then, like you, none in 2015! Weather patterns definitely effect the range of warm weather butterflies, some more than others. If spring comes early, like everyone is predicting, my guess is they will venture further north this season. How is it you are growing Lantana in Minnesota?! Everything I’ve read suggests it needs the warmer climate of lower states. I used to have Lantana in CA and miss it very much. I LOVE Lantana, but up here in upstate NY, I didn’t think it was possible. But if you are growing it in Minnesota, it must be possible. Please do tell more! Thanks! I live in northeast n.y. ,started seeing GST 2010 . they nectar on lantana,beebalm, tithonia and zinnias in my garden. Any advice on how to grow lantana in NY would be very appreciated. Is it perennial up here? Hi Holly, lantana is typically an easy-to-find annual in most regions. Just be sure you are buying from a nursery that grows pesticide-free. Any suggestions where to find Lantana ‘Miss Huff’? I’ve not found it in my local IL nurseries again this season, and I’ve not seen a lot of options to order seeds or plants online. I saw my first Giant Swallowtail in my garden. I followed in thought my yard until I spotted one egg laid on Rue!!! The chrysalis is in my shed over wintering. I hope there will be a butterfly to release along with the Black Swallowtail I also have there. I was totally shocked to see the Giant but so happy it made a stop here in Northeast PA! This year was my first full year raising butterflies. Also became a Monarch Waystation #7105 Pottsville,PA.